There’s something so nourishing about miso soup. Mineral-rich seaweed and miso broth are nourishing, soothing and tasty. I used to spend a lot of money paying for miso soup in Japanese restaurants — that is, until I learned to make it myself. This recipe is fast, easy and cheap. The ingredients are easy to come by in an Asian market of any good supermarket with an Asian food section. 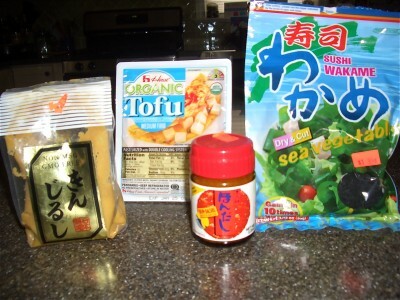 All you need is miso soup, tofu, dried wakame (a type of seaweed). Each ingredient costs less than two bucks per package. Dried seaweed keeps forever. And if you refrigerate miso in a sealed container, it lasts for months. There are different kinds of miso, ranging in color from tan to dark reddish-brown. They each taste different too. I prefer the tan-colored paste which, for some reason, is usually labeled as a “white” miso. And yes, there are organic versions of it around. The secret to a true miso soup is the flavor or bonito, a type of fish. Purists use dried bonito flakes, boil it in water to make a broth that has to be simmered, strained — all way too complicated and time-consuming for me. A short-cut solution is to buy a packet of dried bonito flavoring, which amounts to a lot of salt and usually, some MSG. Frankly, I don’t even bother with bonito. And nobody EVER complains. Another plus: Without the bonito, this dish becomes both vegan and vegetarian. Put miso paste in pot. Slowly add ¼ cup of the water, whisking with a fork until miso paste is smooth. Gradually add in remaining water, whisking with fork to create a smooth consistency. Rinse wakame and toss into the pot. Chop tofu into little squares and toss into the post. Bring the whole pot to a boil. Once it bubbles, remove pot from flame. Sprinkle in scallions, to taste. You can add the bonito granules too (optional). P.S. — Like all my recipes, this one is very flexible and forgiving. Adjust ingredients to suit your tastes. 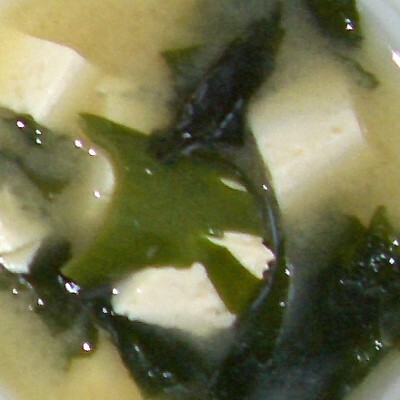 Close-up of re-hydrated seaweed floating with tofu in miso soup! 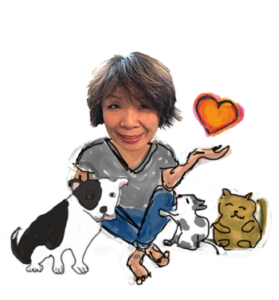 Here is my little journey, thanks to you, of what it is in Miso that may be beneficial. Miso is a traditional Japanese seasoning produced by fermenting rice, barley and/or soybeans, with salt and the fungus kōjikin. The beneficial part here is kōjikin, which contains a filamentous fungus (a mold) called Aspergillus oryzae (Chinese: 麴菌, 麴霉菌, 曲霉菌, pinyin: qū meí jūn; which is thought to be beneficial. The scientific data on this is not conclusive. But this same mold is also found in wines, peanut products and coco. The animal study seem to confirm instances of French paradox (The French paradox is the observation that French people suffer a relatively low incidence of coronary heart disease, despite having a diet relatively rich in saturated fats) There was a study by University of Connecticut, but the results were retracted and the scientists who published the results is under investigation for fraud. Anyway, It is thought that the mold Aspergillus oryza is thought to be a beneficial mold but there is really no proof. There was a study that showed that it may help destroy herpes simplexes and combat vaginal yeast problems. This thought to be a “pro-biotic” but there is no proof un-likeThe bacteria Lactobacillus acidophilus, which is produced by the fermentation of milk (common in making yogurt) aids in maintain a proper PH balance solving vaginal yeast problems , helps keep you regular and may prolong life. This bacteria has been proven able to live in the gut. Additionally, there has been clinical trials that have shown a decrease in instances in colon cancer. The other issue, especially I believe for Asians, who unlike Europeans have developed a tolerance for lactose, is that as lactic acid bacteria actively converts lactose into lactic acid, ingestion of certain active strains may help lactose intolerant individuals tolerate more lactose than they would otherwise have tolerated. There was a law suit in California where there was an attempt to prove the (patented) strain of this type of bacterium in Danone Yogurt (ie Activist, which contains an active strain) The results of that suit were that the the beneficial claims could not be dis-proven, however, Danone yogurt could not show that their patented strain was any more beneficial than any other Yogurt that contained the active bacteria. I hope I am not boring you with all this but the subject of a balanced diet and possible connection to genetics a has been sparked some interest that I feel like sharing. Another thing I discovered is that in the process of making Swiss cheese involves three bacterial fermentation processes. (Streptococcus salivarius subspecies thermophilus, Lactobacillus subspecies bulgaricus, and Propionibacteriumsubspecies shermani). In a late stage of cheese production, the propionibacteria consume the lactic acid excreted by the other bacteria and release acetate, propionic acid, and carbon dioxide gas. This makes the eyes (the holes) Since the lactic acid is consumed by the bacteria Swiss cheese can be better tolerated by those who are lactose intolerant. I think t is important that the cheese is manufactured in the traditional way, IE by aging at-least six months. So what is all the gobble-DE-gook mean for us both? I will have to test the sea weed for beneficial effects and maybe you may be able to discover some western food that have some benefit as well. Brian, I like to keep things simple. All I can say is that miso hits the spot and comes highly recommended by my Chinese medicine man. Hope you have fun exploring!